A tractor trailer drove into an Amtrak train south of Fresno, Calif., causing the last three cars of the train to derail. NBC's Diana Alvear reports. Updated at 7:32 p.m. 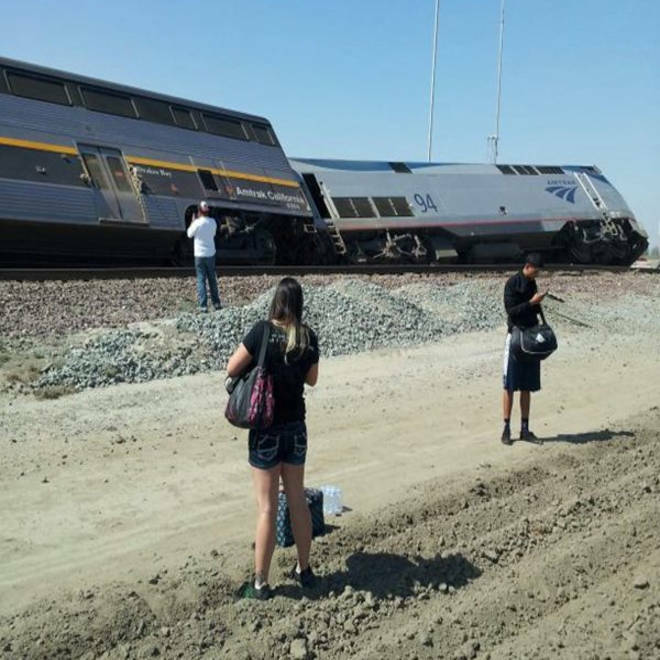 ET: A southbound Amtrak passenger derailed early Monday afternoon south of Hanford, Calif., after a semitrailer ran into it, according to an Amtrak statement. Between 30 and 50 people sustained minor to moderate injuries, Amtrak spokeswoman Vernae Graham told NBC News. According to the Fresno Bee newspaper, the driver of the big rig was pinned in his vehicle. The truck, which carried cotton trash, pushed through the crossing bars and into the locomotive and the last passenger car, Amtrak spokeswoman Vernae Graham told NBC News. She said other alarm signals -- lights flashing and bells sounding -- were in effect. She said 169 passengers were aboard the San Joaquin train, which runs between the San Francisco Bay Area and Bakersfield. "#amtrak train is leaking diesel...can't be good,” Thomason wrote. He also posted an image. The San Joaquin Amtrak train derailed Monday afternoon south of Fresno, Calif. after colliding with a big rig on the tracks. Twenty-three people were injured.